Andrew attended Victoria College and having achieved GCSE grades decided not to continue with higher education. His father, Norman, farmed with his two brothers and as well as growing Jersey Royals they packed and exported the potatoes for a local marketing company. The growing, packing and exporting of daffodil bulbs was also a major part of farming life. 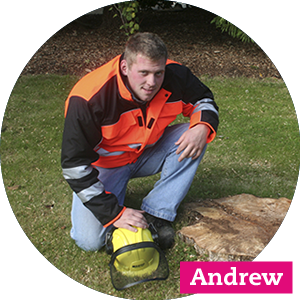 Growing up Andrew enjoyed life on the farm and on leaving school decided to work with his brother in garden landscaping. Some years later Andrew and Norman jointly set up Andrew Le Maistre Landscapes which has continued to grow over the last nine years. Our Company has been very fortunate in finding dedicated staff whom under the guidance of Andrew and Norman provide all our customers with good quality work. Fully insured, both Andrew and Norman and all the staff continually undertake training courses in all aspects of garden landscaping keeping up to date with modern trends ensuring that our Company can offer our customers up to date ideas and designs. Health and safety is of utmost importance and safety training courses are regularly renewed. 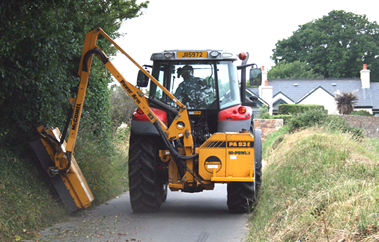 With all manner of tractors big and small, specialist plant and equipment such as stump grinders, corers, flails, hedge cutters, mowers and hand operated tools we can take care of any of your garden and land management requirements. If access is restricted to your garden or land with the range of machinery at our disposal you can rest assured that we can complete any task as efficiently as possible, even if that means using a crane to lift plant or materials over your wall. We continually up date and purchase new machinery which proves cost effective when quoting for work. As can be seen when viewing this web site we pride ourselves on providing the highest quality workmanship and we are able to work on both elaborate and extensive projects as well as the simplest of gardens. Testimony to the quality of our work is the fact that our Company is a member of the British Association of Landscape Industries and a member of Genuine Jersey. From design to completion, Andrew, Norman and all the staff are dedicated to providing the same personal and professional attention to all our clients. Give Andrew a ring and he will only be too pleased to come along and give you ideas on making the most of your property.